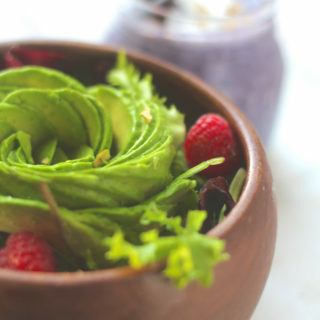 This aesthetically beautiful, amazingly tasty, and extremely easy Avocado, Greens & Raspberries salad can be ready in under 5 minutes. 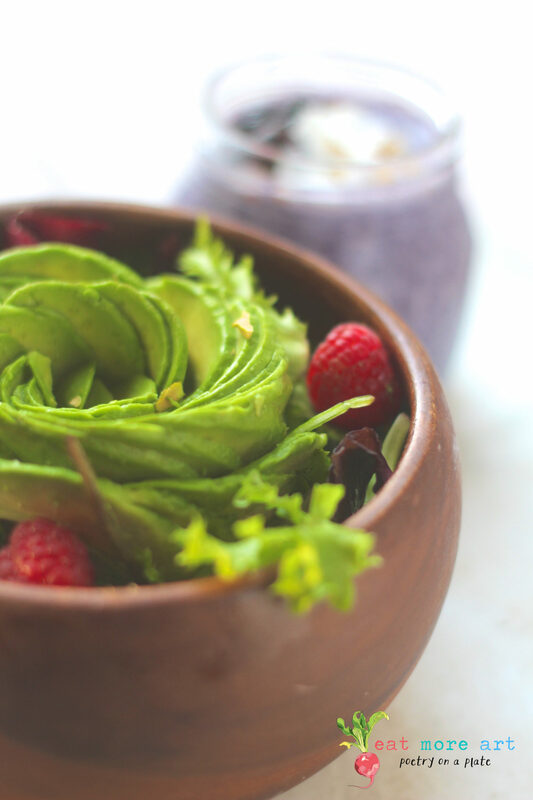 Bonus – the recipe includes video on how to make an avocado rose. It’s gonna be a month, not just of cookies, cakes, and chocolates, but also of salads and smoothies, so that walking into the new year can be a cake walk And with that thought, I decided that beginning December with lots of healthy eating. It’s a simple salad with few ingredients. I paired it with a blueberry smoothie. The recipe of which, can be found here. I did skip the blackberries for this one. Mix the salad ingredients, place the avocado rose on top of it, drizzle with salad dressing, sprinkle some salt & pepper and top it with chopped pistachios. I used blue cheese vegan salad dressing.